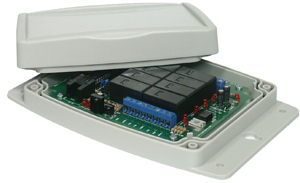 This remote control is available for special order for the control of all our relay products. It can also be order in a high output version for long distance control. The 8 keys are available as shown with number 1 to 6 and one green and one gray key. It is also available with all black or all gray keys. This way you can print on the label what you need. 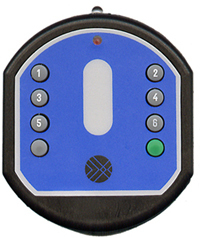 The Cir2A2 style remote control have a battery door that screws on with the palm of you hand which keep the batteries from falling out if the remote control is dropped. Many key gram froce available. Key colors: Black, gray, blue with other optional color available with special orders.